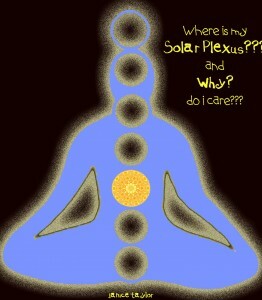 According to Hindu texts, the Solar Plexus is the seat of your third Chakra. This Chakra is situated just below the sternum (where your ribs attach in the front). You can imagine it to be a beacon of light, which radiates from the center of your body. Its energy jet propels you to move forward, toward fulfilling your dreams and goals. And you can further imagine that the Solar Plexus Chakra is where one can find and cultivate energy that can enable you to turn DESIRE into ACTION!!! It is home to our Want Power muscle (previously known as Will Power muscle). WANT – WILL – ACTION: What we WANT fuels our WILL and it, in turn, provides a spark of energy that ignites us into ACTION. The Solar Plexus is the crucial point in our bodies where our ‘parts’ – often opposing parts – have an opportunity to meet and join forces. These words can shed light on your inner battle, as they help us to understand that our desire to eat cake is not 100% wrong, nor is our desire to eat healthfully 100% right. As neither side is wrong nor right, then there is an opportunity for understanding, for loving-kindness and inner-peace. When we scan our bodies from top to bottom, moving down from our foreheads to our toes, let’s remember to pause at the Solar Plexus with an open heart and allow both ‘parts’ to say what they need to say so that the battle can end. Make peace with your parts. Sometimes it’s just that simple! For more “simple,” join Our Lady of Weight Loss’s KICK in the TUSH Club!